Do I have to be home for you to come and give me a quote? Quote will generally be left at your doorstep or pre-arranged location at the house. Alternatively, the quote could be sent through email. Do I need to be home when you come to do the work? No, but we need to ensure clear understanding of the scope of work contracted. An accessible standard 110 outlet is necessary to complete our work. A contact number would also be valuable. How long does installation of gutters and gutter protection take? Most gutter installations are completed within one day. Skilled crew working in Bellevue, WA. Do you have an email distribution list for updates or special discounts? Yes, occasionally we are able to offer special discounts on maintenance or on the products we install. With your permission, your email would be added to our database for this purpose only. No emails are sold to other companies or organizations. Do you install .032” thick gutters? We can install.032” gutters, if that thickness is available in the color of your choosing. It is not available in all colors. In my experience, .027” thick gutters, which are considered standard use, are adequate for most applications. “A lot of the strength of the gutter comes from the quality and placement of the hangers.” We place Raytec Hangtite hidden hangers and screws every 2 feet. This permanently secures the gutter to the fascia and provides support for ladders leaning against the gutters. We have a written warrantee on the back of every invoice. This warrantee provides 12 year coverage against leaks and workmanship issues. We are committed to quality product and quality service. Yes, however, if we have a color which closely matches your trim, I highly recommend not painting your gutters. The original paint on the gutter is high quality and very easy to clean. Painted gutters tend to have a more porous surface, which makes them harder to clean. Mildew can also become embedded in the paint. Is your company a “green” company? 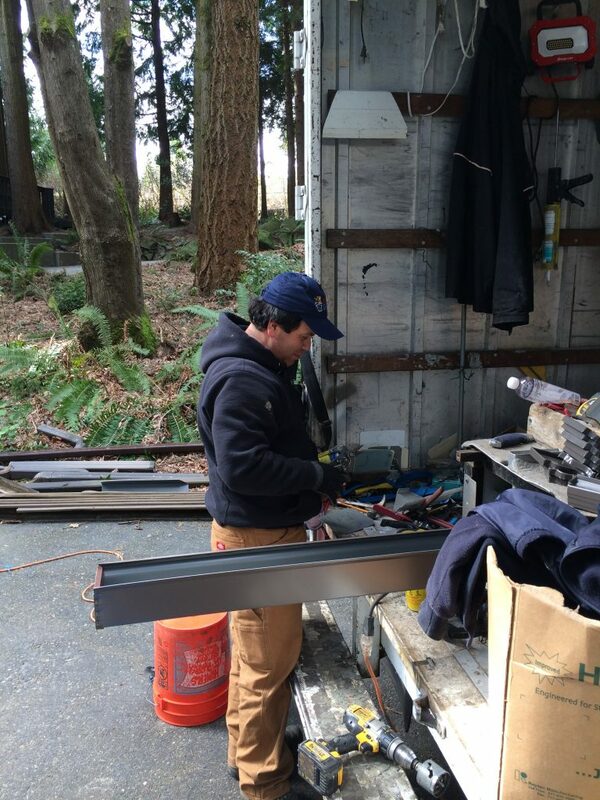 We recycle virtually everything which is removed from the job site. 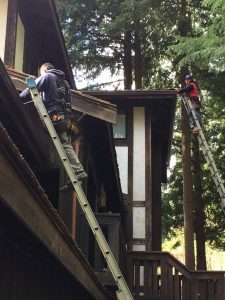 Skilled crew replacing gutters in Bellevue.